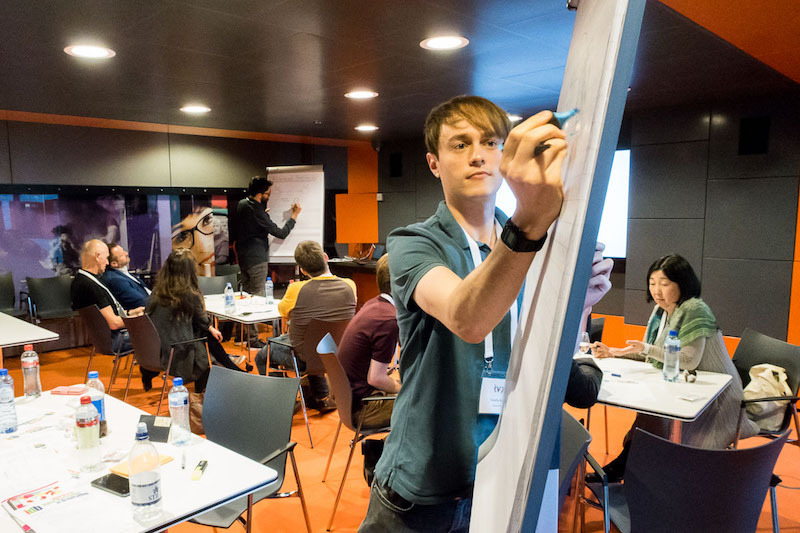 VisualMedia partners NTNU, Brainstorm Multimedia, and Never.no organised the ‘Workshop on Interactive Digital Storytelling in Broadcasting’, the idb, at the ACM TVX 2017 conference in Hilversum, the Netherlands, 14 June 2017. There were 21 participants in the workshop. The goal of the TVX idb 2017 workshop was to discuss new ways of information generation and delivery in the traditional broadcasting sense and in the public use. The CEO of Never.no, Scott Davies, talked how social media can be used in broadcasting. He discussed concepts on how the use of social media will change in the future. Especially, he pointed out how large amounts of social media data can be used in broadcasting. Four accepted papers were presented in the workshop. Two of which were originating from the VisualMedia project and were presented by Hardald Renz (Signum) and Veli-Pekka Räty (NTNU), and two outside the consortium that were presented by Peter Schulz (xmedia concepts) and Nicolas Patz (rbb). All papers will be published in the TVX ’17 Adjunct Proceedings. Half of the time in the workshop was used to create new ideas. The participants created new concepts which included 360 VR, and sensor-based broadcasting. The workshop ended with a panel discussion on how the role of traditional broadcasting will change, and how to bring back younger audiences. VisualMedia project, led by Brainstorm Multimedia, is about integrating social media, innovative 3D graphics, and new interaction systems in the broadcasting industry. This project has received funding from the European Union’s Horizon 2020 research and innovation programme under grant agreement No 687800.